Jacobs & Pinta represents lenders, developers and business entities in commercial litigation, receiverships, UCC sales, foreclosures, and debt collection matters throughout the State of Illinois. The firm also assists clients with loan documentation, loan modifications, collection restructure and forbearance, leasing, real estate development and entitlements, and real estate closings. Jacobs & Pinta prides itself in providing personal attention to every matter referred to the firm, well-reasoned and prompt responsiveness, and cost-effective strategies and results. Tina Jacobs and Joy Pinta have a combined experience of 37 years providing legal advice and assistance in a variety of legal issues related to the lending industry, real estate development community and collection of debt. Both Tina and Joy subscribe to organizations and resources to keep abreast of the continuing changes and development in their areas of practice and bring that knowledge to the facts and issues unique in each matter handled by the firm. 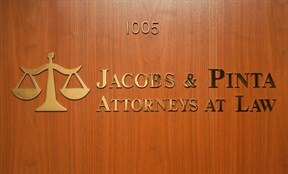 Jacobs & Pinta prosecutes and defends lenders in commercial foreclosure litigation, including issues relating to jurisdiction, receivers, mortgagees in possession, lien priorities, building code and zoning issues, forbearance and modification agreements, consent foreclosures, and deeds in lieu of foreclosure. We represent lenders in bankruptcy proceedings, fraudulent transfers, landlord-tenant disputes, UCC perfection and enforcement, and defending a variety of other litigation issues. We also represent and counsel lenders, commercial entities and individuals with respect to commercial loan documentation and real estate development, including purchase and sale agreements, land use, zoning entitlements, and financial assistance.